Serero, Rantie seal Bafana qualification! Goals from Thulani Serero and Tokelo Rantie saw the South Africans win and, most importantly, qualify for the tournament to be hosted by Equatorial Guinea. BAFANA VS SUDAN AS IT HAPPENED! For the better part of the first half Bafana were casual in their approach, but as soon as they got going it was difficult to stop them in their tracks. As expected, they started on good footing and as early as the fourth minute Rantie made a burst at goal, beating one defender, but he was crowded afterwards. In the eighth minute Bafana got the first corner of the match and Oupa Manyisa took it but it was cleared. However, the ball fell kindly to Thulani Serero who picked it up just outside the box and tried his luck from distance, but dragged it wide of the right-hand upright. As much as Sudan were sitting back and absorbing the pressure there were moments when they made forays forward and, in the 16th minute, Darren Keet was forced into making his first save, clutching onto a long-range effort from Omer Mahmoud. The team’s captain on the day Dean Furman then gave the ball away in the 23rd minute and Sudan looked to capatilise, but Andile Jali tracked back brilliantly to cut out the danger. On the half-hour mark, Sudan broke straight through the middle and were one-on-one, but Sibusiso Khumalo tracked back with a brilliant tackle to deny the striker. After those worrying moments for the approximately 32 000 Bafana fans in the stadium, Serero eased those worries when he got his first goal for the country in the 38th minute, tucking home Rantie's cross. Bongani Ndulula could have got another one for Bafana on the stroke of halftime following a great run from Khumalo, whose cross took out a defender and the keeper, but ‘Drogba’ missed an open goal. Straight after the break Rantie had a great chance to put the game beyond doubt when he chased down what looked like another lost cause. However, the ball bounced kindly for him, but the goalkeeper pulled off a good save to deny the shot. Serero played in Rantie, who swerved past one defender before opening up his body and curling into the top corner. Again, Bafana started to look a bit casual in their approach as Sudan tried to get back into the match – and they did in the 76th minute when Salah Ibrahim pulled one back as the defence fell asleep at the back to concede their first goal in five matches of the qualifiers. That set up a tense finish as first Sudan had the ball in the back of the net with a minute to go, but it was ruled offside, and then Ibrahim went down in the area under pressure from Khumalo, but the ref waved play on. 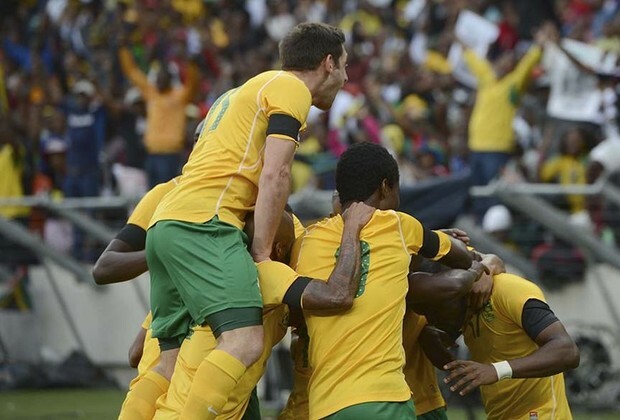 Bafana held on to win 2-1, and qualified for a major international tournament for the first time since 2008. South Africa XI: Keet, Mathoho, Coetzee, Khumalo, Ngcongca, Manyisa, Furman (c), Jali, Serero (Letsholonyane 88th), Rantie, Ndulula (Sekola 58’). Sudan XI: El Moiz, Elrayah Ali (Salaheldin Mahmoud), Ali Gafar, Amir Kamal Suliman, Faris Abdalla Mamoun, Omer Mahmoud Kosti, Bakri Abdelgadir, Mohamed Tahir (Salah Ibrahim 59th), Nazar Hamid (Nasreldin Omer 46th), Eltaher Elhag, Mudather Eltaib.